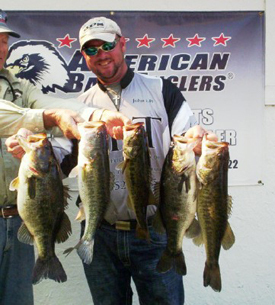 Titus Langston won the American Fishing Tour, presented by American Bass Anglers, Division 76 tournament, held March 16, 2013, on Lake Talquin near Tallahassee. The Quincy, Fla., angler won with a five-bass tournament limit weighing 18.48 pounds to collect 200 points toward the divisional angler of the year title. He anchored his bag and sealed the victory by bringing in a 5.49-pounder that took tournament lunker honors. For the victory, Langston pocketed $365. Despite the muddy conditions, Langston still concentrated on sight fishing around spawning beds to win the tournament. In second place, Rob Lawhon caught five bass going 15.24 pounds. John Waush followed in third place with 7.07 pounds. Kyle Brooks placed fourth with 6.39 pounds, followed by Mickey Roach with 5.42 pounds. Wrapping up the top six anglers, Len Lindahl brought in 5.32 pounds. The anglers could fish anywhere on the 8,800-area lake spanning the Ochlockonee River in Leon and Gadsden counties of northern Florida about 10 miles west of Tallahassee. Created in 1927, the name comes from a contraction of Tallahassee and the nearby town of Quincy. Each of these anglers earned valuable points toward the divisional angler of the year title. The points champion from each division will compete in the annual American Bass Anglers AFT Angler of The Year Final Round Fish-Off. In addition, the top 500 anglers from the AFT divisions in more than 40 states will earn the right to compete in the three-day AFT National Championship tournament, slated for Clarks Hill Lake near Appling, Ga., on Oct. 23-25, 2013.